After much frustration and time spent away from my sewing machine cooling off, I was able to finish the quilting on the Spaceship Tic-Tac baby quilt today. I had originally hoped to complete this quilt on Wednesday, but my sewing machine and I were disagreeing about that! I was able to use thread that I had on hand for the quilting. I did my best to color match to the blocks by using black, variegated orange, and variegated yellow/green thread for the top and a navy blue thread for the bobbin to match the backing. 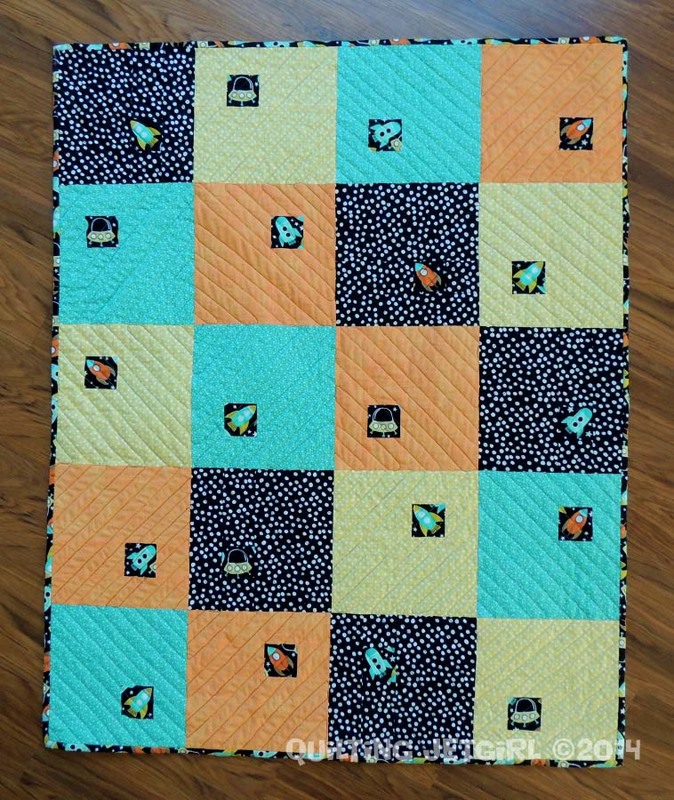 I wanted to alternate diagonal lines on the blocks, and beyond fighting to keep the thread from breaking as I was quilting, I made several mistakes on orientation and spent a goodly amount of time ripping stitches and re-quilting blocks in the correct orientation. Thankfully, it is finished now and I do like the patterns the alternating diagonal lines form on the quilt. I had *just* enough of the fun spaceship fabric left to bind the quilt, which after its first wash measures 34″ by 42″. 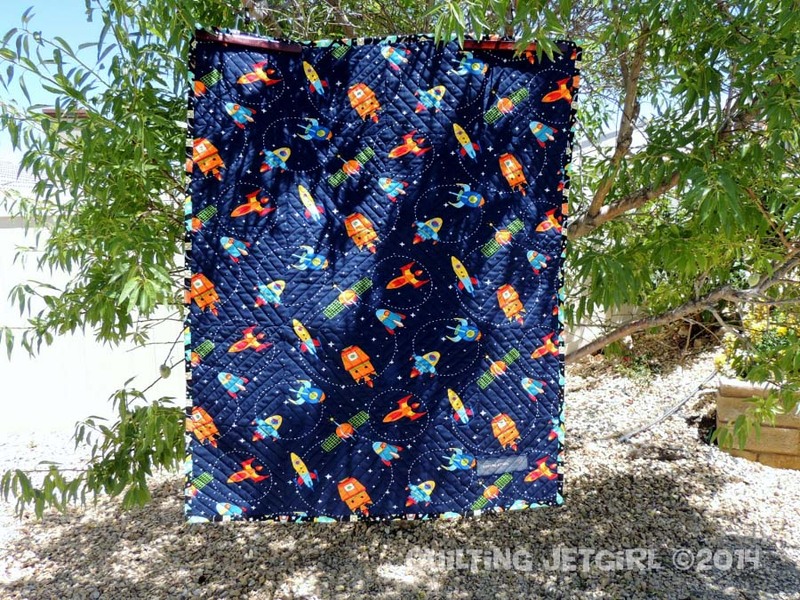 For the backing I found another super cute spaceship themed large print with a navy blue background. It was a beautiful afternoon, and I was able to get a few nice photos of the quilt hanging from our almond tree in the backyard. It does look amazing all finished. It looks like the rockets are ready to fly into orbit. And I like your wider binding. Another fun quilt. I like your space theme 🙂 Sorry to hear about your machine trouble though. 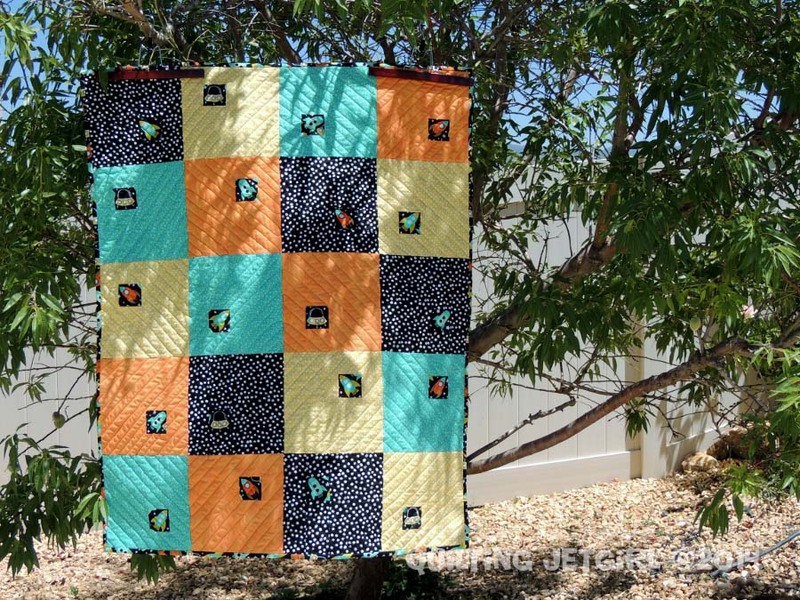 I like the straightlin quilting too – makes some of them look like they are zooming about the place! The quilting looks great! I love the secondary diamonds that show up. And I love the bigger photos!! I like the detail that the straight line quilting adds, beautiful! 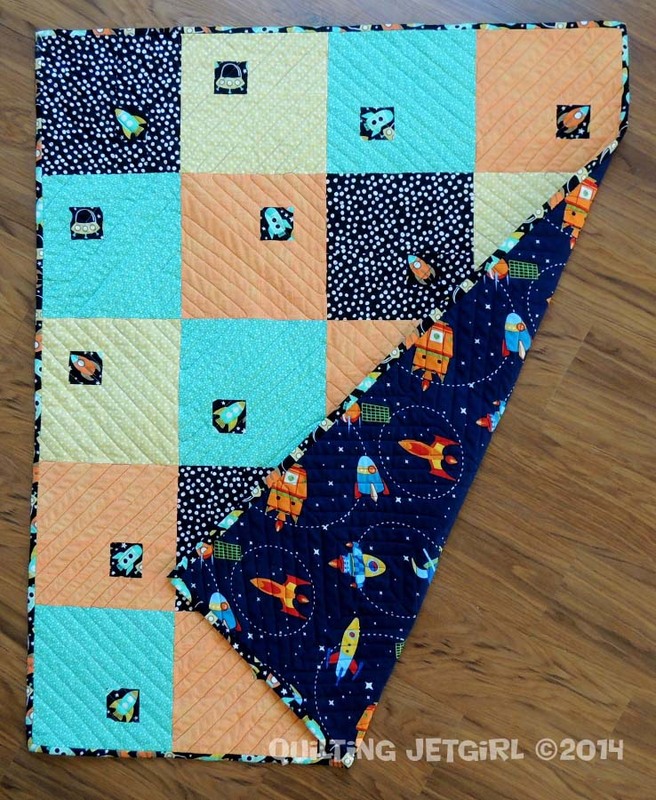 Love how the spaceship squares bounce around the quilt! I like the spaceships, this pattern really works well with the fabric. I have the same problem with stich length on my machine, and it took me a while to figure it out, all of that seam ripping and starting over is frustrating. It turned out very well though! What a great quilt! 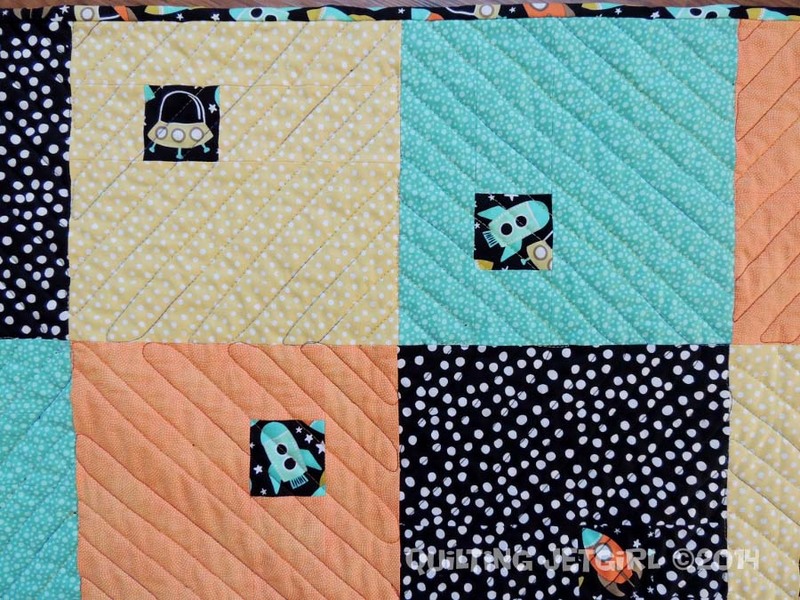 I really like the diagonal rows in the quilting.